Many monuments bear witness to high mortality among infants and children in the past. Particularly moving are so-called ‘chrysom’ figures of babies in swaddling bands, which became more widespread from the later fifteenth century. Yet whereas swaddled babies are instantly recognisable, identifying tombs of older children can be difficult. A small-sized tomb may deceive the beholder into thinking that it must commemorate a child, but there may be other explanations. The freestone monument to the so-called ‘Stanley boy’ at Elford (Staffordshire) is a good example of historical misinterpretation. St Peter’s church at Elford was completely restored in the Victorian period and its monuments repaired in 1848 by Edward Richardson, who also restored the military effigies in Temple Church London and whose reputation is questionable. 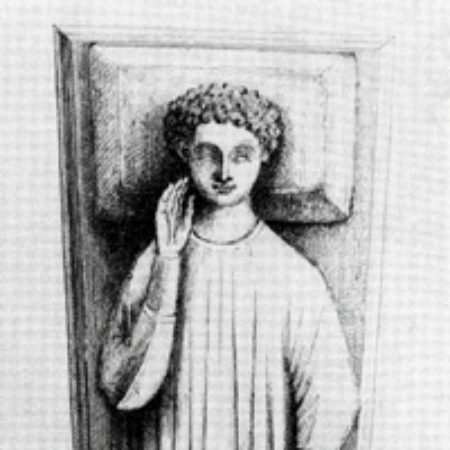 At first sight, the ‘Stanley boy’ tomb appears to be that of a child: it is small in size and the male effigy has short hair, seemingly childlike features, and wears a simple robe that ends well above the ankles. Unusual are the hand gestures: the left hand holds a round object while the right touches the side of the face. The monument is traditionally said to commemorate John Stanley, the last male heir of the Elford Stanleys who was fatally hit by a ball around 1460, but there are no historical records to support this identification. The story itself can be traced back to at least the late sixteenth century: it was recorded by the Staffordshire antiquarian Sampson Erdeswicke (d. 1603). 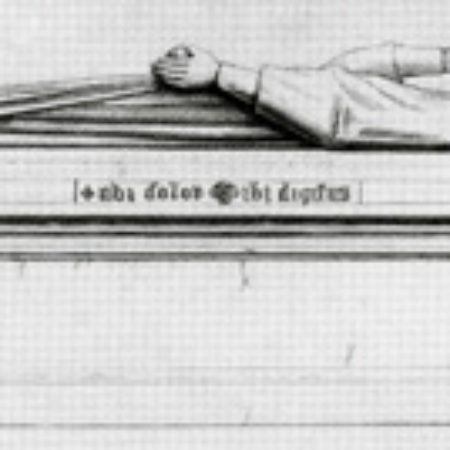 The manner of John’s death is apparently indicated by the object in his left hand and by the right hand touching the point of impact, as confirmed by the Latin motto ‘Ubi dolor ibi digitus’ (Where the pain is, there is the finger). The plinth with its motto is probably Richardson’s work, however, and he was also the first to interpret the ball as a tennis ball. Moreover, there is a curious discrepancy in early accounts of the effigy: Erdeswicke described it as ‘holding a ball to his ear’, whereas according to Thomas Pennant in 1781 ‘one hand points to his ear; the other holds a ball’. The church notes of Erdeswicke’s collaborator William Wyrley identify the ‘Stanley boy’ as the heir of the fourteenth-century house of Aderne and thus much earlier than the traditional c.1460 date. In fact, the effigy is thirteenth-century in style and the true explanation of this monument is probably less sentimental. During the Middle Ages, separate heart burial became a mark of prestige: it offered a focus for prayers for the deceased in more than one location and allowed families to patronise different churches. Miniature effigies were sometimes erected to mark such heart (and sometimes entrail) burials: examples can still be found at Coberley and Berkeley (Gloucestershire), for example. Over time these were often mistaken for child monuments. The Elford effigy may originally have commemorated a heart burial with the ‘ball’ in the left hand representing the heart. Historical evidence and the figure’s overall appearance suggest that the effigy we see today may be a post-medieval forgery to replace a badly damaged thirteenth-century monument that had already attracted antiquarian interest. It is worth noting that Richardson stated that the effigy required only minor repairs in 1848 whereas other monuments in the church were very dilapidated. The unusual gesture of the right hand may have been introduced by a forger in the seventeenth or eighteenth century to illustrate local legend even more convincingly. ● Erdeswicke, S., A Survey of Staffordshire (London, 1717), p. 162. ● Oosterwijk, S., ‘“A swithe feire graue”: the Appearance of Children on Medieval Tomb Monuments’, in R. Eales and S. Tyas (eds), Family and Dynasty in the Middle Ages (1997 Harlaxton Symposium Proceedings) Harlaxton Medieval Studies, 9 (Donington, 2003), pp. 172-92, esp. p. 190 and pl. 46. ● Oosterwijk, S., ‘Of Tombs and Tales …’, CMS Newsletter, 22:2 (Winter 2006/7), pp. 16-18. ● Richardson, E., The Monumental Effigies and Tombs in Elford Church, Staffordshire. With a Memoir and Pedigree of the Lords of Elford (London, 1852), pp. 8, 21-22.